The supernatural has always played an important role in the background of the city of Winchester. There are tales of spectral monks at Winchester Cathedral and phantom horses in the Cathedral close, as well as stories of the Eclipse Inn, where Dame Alice Lisle, condemned by ‘The Hanging Judge’ Jefferies, still walks. But perhaps it should come as no surprise, once one becomes aware of the city’s wealth of history, to hear that ghosts are said to haunt almost every inch of Winchester within the old city walls. 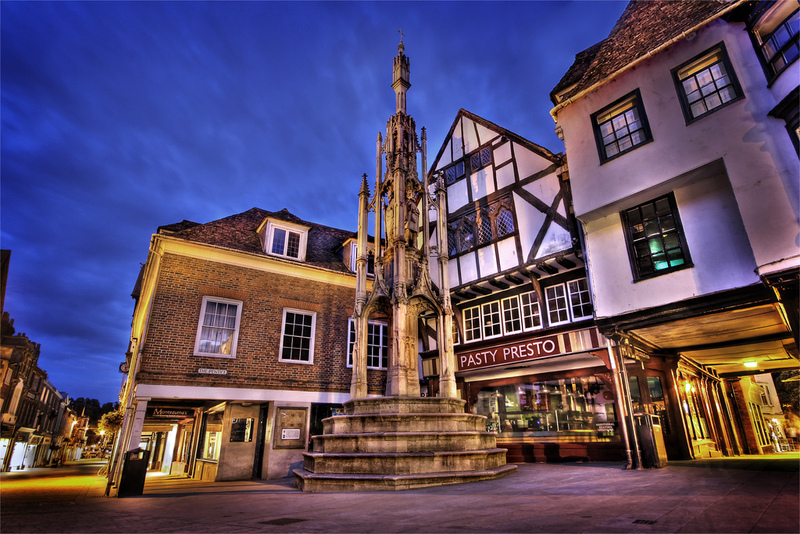 Perhaps the strangest ghostly account of Winchester concerns the statue at the heart of the city known as The Buttercross. It is hard to believe but Winchester, which nowadays is a tranquil little market town set amid docile hay meadows and watercress beds, was once the most important city in Britain. Capital of the ancient kingdom of Wessex, the city of Winchester was also the headquarters of the Anglo-Saxon Kings, starting with Alfred the Great, until the Norman Conquest in 1066. Even then, Winchester continued to rank alongside London and not only did William the Conqueror’s coronation take place in both cities but he also commissioned the local monks to prepare the Domesday Book from here. Winchester only began its decline into provinciality after the Battle of Naseby in 1645, when Oliver Cromwell took the city, and Hampshire’s county town now has a scholarly and slightly anachronistic air, embodied by the ancient almshouses that still provide shelter for senior citizens of ‘noble poverty’. The Buttercross marks the spiritual centre of Winchester and is an arched cross on a plinth with four smaller statues carved into its niches. At one time all distances were measured from here and it remains an important meeting place to this day. Despite this, visitors to Winchester will find it interesting to note that no matter how busy, hot and crowded the city becomes, very rarely will you ever see anyone sitting on the steps of the Buttercross, which admittedly seems like a perfect place to rest your feet. On the odd occasion that someone takes a seat there they never stay long, for one of the locals usually walks over, whispers in their ear, and they jump up as if scalded. What are they told? Something like this: the story is told time and time again of a curse which was placed on the Buttercross in the middle ages by a witch who was held there before being burnt at the stake. Effectual from the moment that a person’s behind comes into contact with the statue, the curse compels the unwary sitter to return time and again to the city. Such is the pull of the Buttercross – a good reason to always check the local folklore before sitting anywhere!